Seal has been in the music industry for just a little under 30 years now, and after all of this time, he has lost none of his early enthusiasm or energy. His passion and commitment to music is best demonstrated when witnessing him singing live and attending one his concerts, or “meetings”, as he likes to call them. 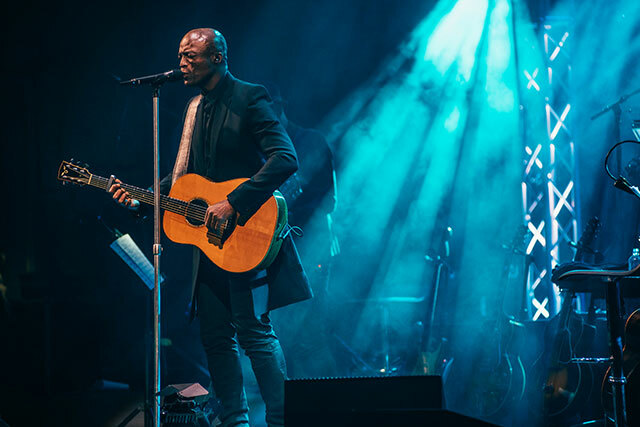 Taking the stage at the prestigious London Palladium, Seal was out to give a world-class performance. His 10th album – Standards, was released late last year, and it features covers of classic songs, which are showcased in his current tour of the same name. He manages to pour liquid soul over every familiar song sung. Seal opened the show in his hometown, wearing an immaculate suit, backed by his classy big band, to Luck Be a Lady and I Put a Spell on You. His effortless vibe and charisma oozed straight away, and put the audience in to a feel-good mood. Classy, strong, entertaining, Seal delivered not only on every song – but also in-between every song. Talking to the crowd, making everyone feel included, making everyone smile, cracking jokes, discussing important topics and also interacting with lucky individuals, it felt like an intimate and personal performance. Some wonderful tones and slickness on the likes of I’ve Got You Under My Skin and That’s Life continued the happy vibe of the evening. Killer is one of Seal’s most loved songs and this brought the party to the London Palladium. The song had people up and out of their seats, to dance, dance, and dance some more. Even the floor in the seating area where I was positioned, was bouncing! I’ve never seen the London Palladium literally ‘rock’ before! Seal jumped down from the stage, to get closer to the crowd, as he walked and danced his way through the audience, Seal held hands, high-fived and serenaded individuals in the audience and it was a moment of unbridled magic. Taking to the stage with an acoustic guitar, he told the audience about his early writing experience. He explained that he was really disappointed after writing his first ever song. He didn’t want to ever perform it, and was upset when one of his friends heard it and told everyone about it, and then, there was no getting away from it. Can you believe that he was talking about his sublime song, Kiss From a Rose? Listening to Kiss From a Rose – as featured on the Batman Forever film – sung live is something to savour, note perfect and timeless, this is Seal at his best. He went on to perform a bouncing and high-energy rendition of his brilliant song, Crazy. This continued the party vibe, to a backdrop of twinkling fairy lights and multi coloured lights and the atmosphere in the room was at fever point. Seal is down-to-earth, classy, engaging and full of uplifting energy, his concert has it all. Seal proved what a class act he really is.